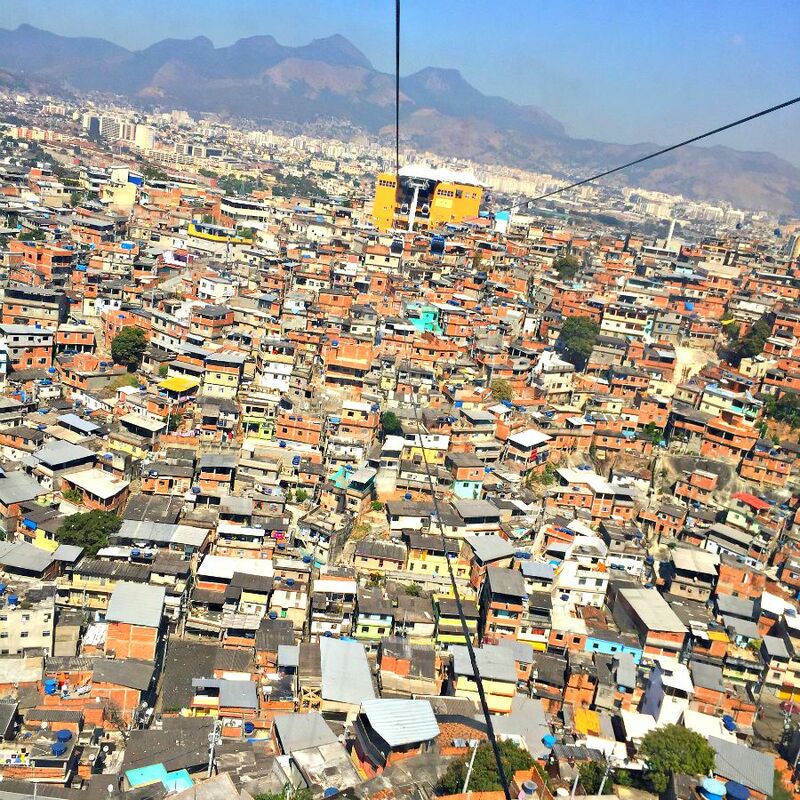 Favelas, the famously gritty neighborhoods that ascend Rio de Janeiro’s steep hillsides are nothing new – they’ve been here for over a hundred years. But they’ve are getting lots of attention these days. 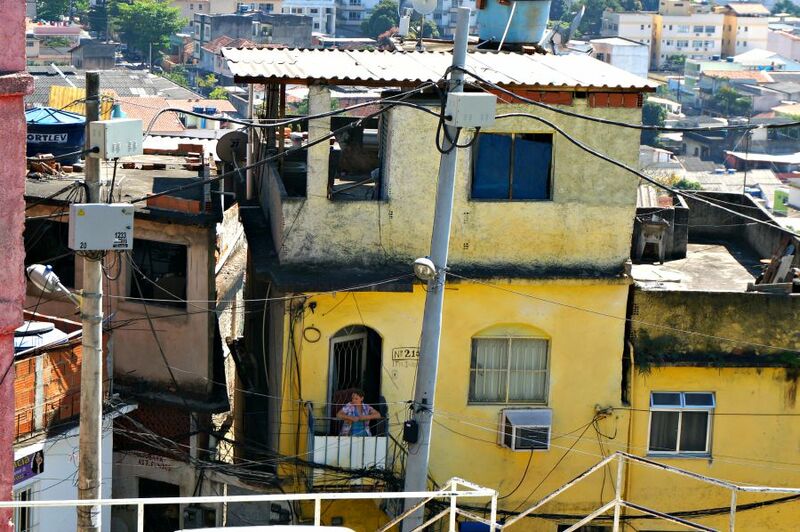 Some of these congested shanty towns (which often boast the best views of Rio) are getting new paint jobs and are being “gentrified” with hostels and hotels popping up, and even the rich and famous moving in. Soccer star David Beckham and singer Madonna are neighbors, both having bought homes inside the Favela do Vidigal. But despite the popularity of some neighborhoods, the one we visited called the Complexo do Alemí£o seemed not to have gotten the memo. This group of favelas (the word means “neighborhood” in Portuguese) are in a northern section of Rio de Janeiro made up of six hills. We visited with a local guide, a Dutch architect who works on urban renewal projects, including developing green spaces where people can gather and children can play. She informed us that the area was once owned by a Polish man who purchased what was then vacant land. He sold small parcels of land over time to families who have developed their own little conclaves, with seemingly no planning, rhyme or reason. Although, our guide observed, this is very much in line with the mind-set of the people who reside in these neighborhoods. It doesn’t take long after arriving in Rio to find out a few things about the people who live here. They like to make a lot of noise – whether that be yelling to a neighbor or playing music late into the night. You can’t walk far down the street without finding a jovial gathering laughing, seemingly always on the verge of breaking into dance and song. This is as true on the beaches and in the downtown areas as it is in the crowded favelas. It is inviting, infectious and uniquely Brazil. We met many expats who fell in love with Brazil and moved here for this very reason. 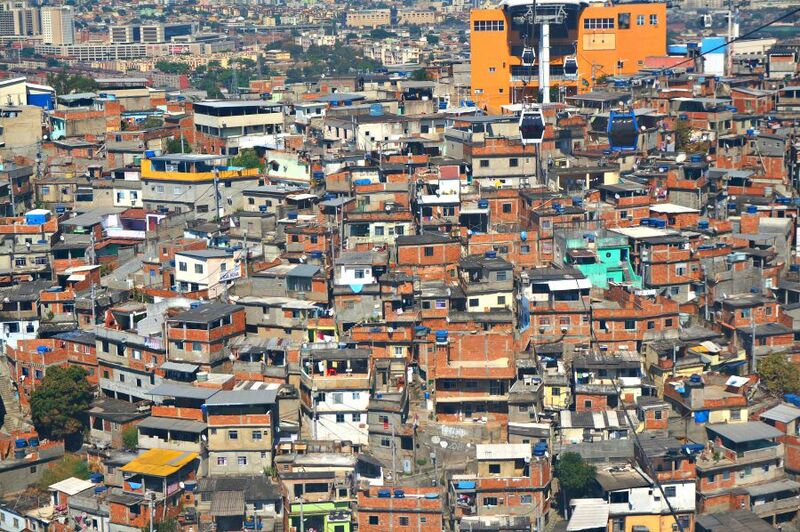 The favelas are filled with contradictions – you can look over a sea of favela homes seemingly on the verge of collapse, and lament the lack of long-term planning. However, the unfinished houses with exposed rebar are often long-term works in progress, with the owner planning to add the next story when time and money allows. But, like everywhere in the world, immediate needs and desires come into play as well: but most of the partially built houses are fitted with a satellite TV dish. During our tour we rode the recently constructed cable car network over the area. Completed in 2012, the cable cars are just one improvement in the area, of which there have been many over the years. The homes have electricity and running water (unlike 50 years ago where many homes were made of wood and the ground was flooded). The government paved streets so they can accommodate public transportation vans and built concrete staircases to make the area more accessible. Many of the cable car stations also have a social works project inside, such as a library, and medical clinics, as another resource for the locals. The army and police have intervened to reduce the historically high level of gun and drug violence. Although residents complain that violence remains a huge problem and the police have become just as involved in provoking gunfire and selling weapons as the drug lords they were assigned to combat. Whether or not this is accurate is beyond us to evaluate, but suffice it to say that while progress is being made, tensions are far from over. Our guide, who also volunteers with to support a school in a favela, said that she is frustrated with the lack of progress despite knowing that the government has money to make some improvements. You won’t be in Brazil long before you hear the word corruption – frequently. 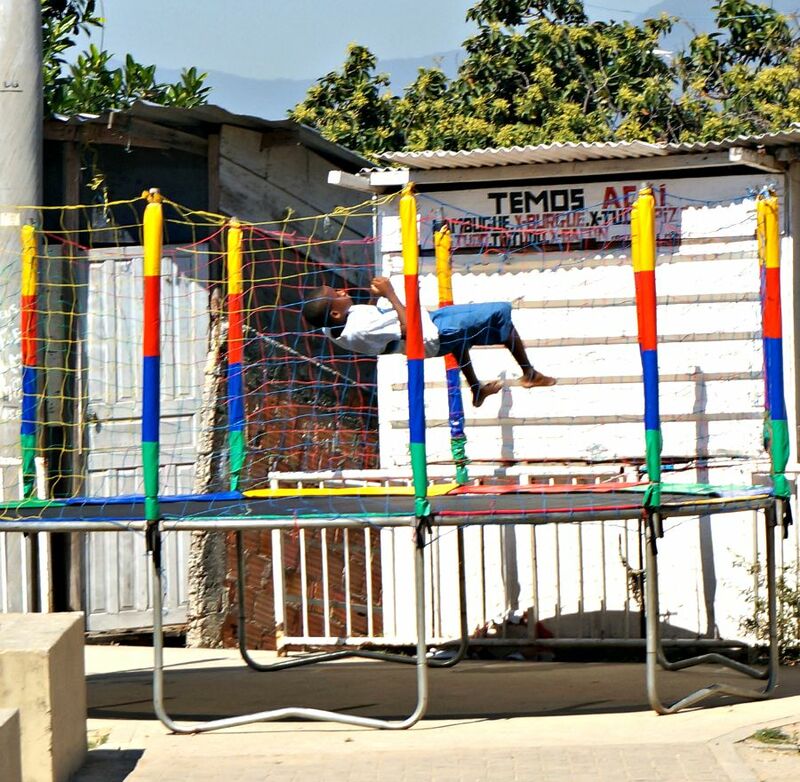 Change does not come easy here, particularly when a large percentage of the population who live in the favelas can’t write or read, and don’t send their children to school. Our guide also pointed out that some of the improvements that have been made have been destroyed by residents, a message that although the government is intervening, the drug lords and residents still have a prevailing influence. There are no easy answers, and there are certainly barriers for change in every direction. Despite all of this our guide was clear that you cannot judge the people and the situation by just what you see on the surface. 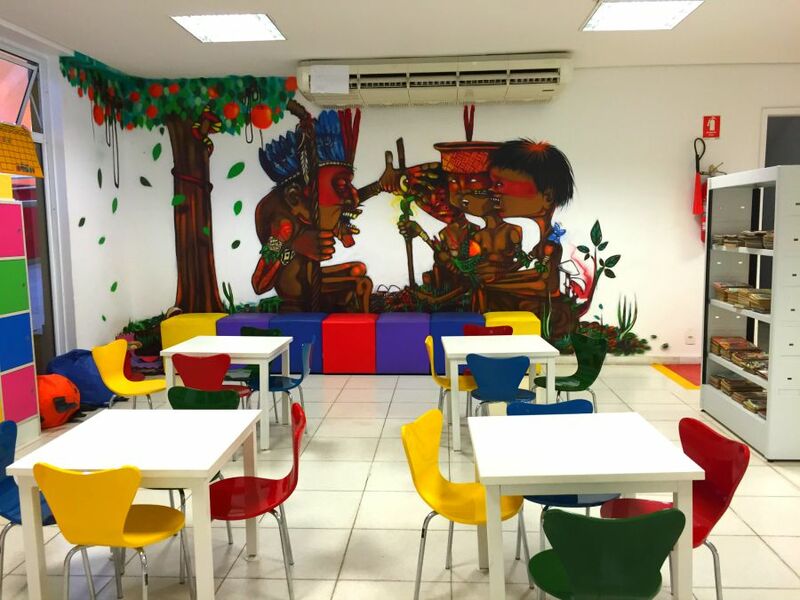 The people who live in the favelas, for example, actually tend to have relatively nice interiors that they share with their families for generations. It is uncommon to see a permanent roof on a building because that would mean that you were done building – that you were poor and out of options. The people many just be focused on today, but that focus remains, despite all of their challenges, to be a pretty positive one. Maybe that is the reason, that despite our inability to walk in the neighborhood due to recent gun violence, there are still numerous kites flying over the neighborhood, and children laughing and playing. There is a flurry of activity in Rio as it prepares to host the 2016 Olympic games. A shiny new stadium now sits directly across from a tattered shanty town – an interesting juxtaposition and hint to the priorities here. I wondered as we left what the effect of having the upcoming Olympic Games would have on Rio. It is truly amazing what can happen when a community comes together with one vision. Is it be possible that the presence of all these athletes carrying with them the pride of their nations along with all of the eyes of the world would have an uplifting impact on Rio? Maybe the games could become a banner for change, like a kite in the sky. I, for one, will be watching, and hoping. A Special thank you to Context Travel, who provided us with this tour. 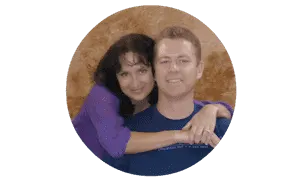 Visit them to learn more about the tours that they provide and the work that they do to support the communities that they serve. As always, our opinions are our own. An excellent article. Your story tells of the real Rio. I hope like you, the olympics has an uplifting effect on the city. We haven’t been to Rio, so it’s interesting to read about some of the improvements they’ve made recently. Hopefully, the Olympics will continue to bring the area together. It’s great to have a tour that gives you a feel for real life. It’s such a hard balance between bringing health, sanitation, and safety to a neighbourhood while still managing to hold onto history and character and charm. I love the fantastic colors of the mural at the cable car stop – I’m guessing they reflect the colorful nature of the surrounding community. It sounds like the tour is a interesting and unique way to see another side of Rio. I plan to go there next year so I’ll check out Context Travel. 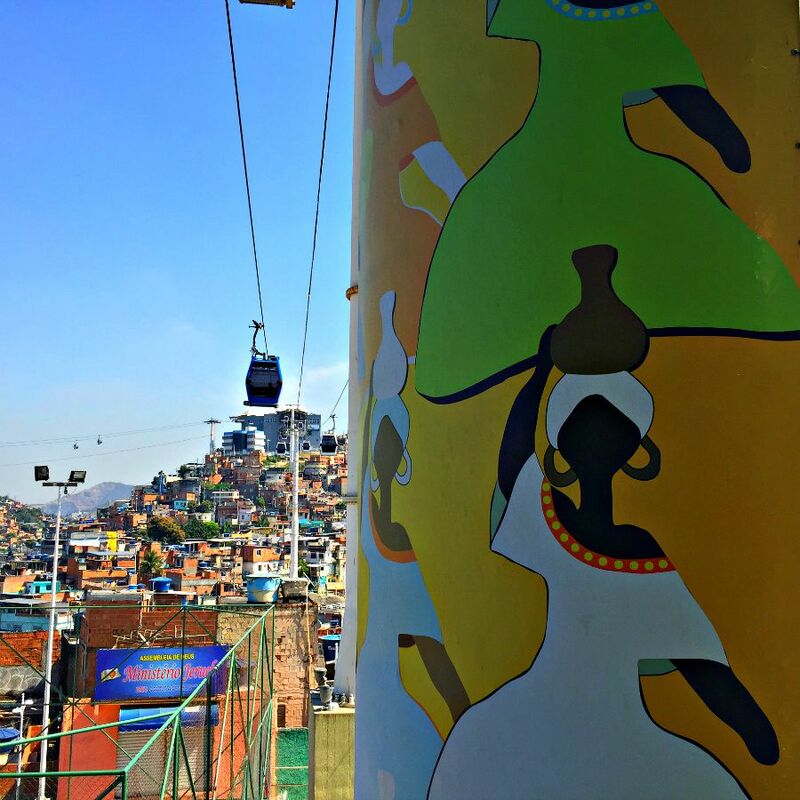 For me, this is where I’ll say: “there is beauty in chaos”… these favelas have a certain charm to them. Anyhow, it’s great to hear the inner workings of this part in Rio. I haven’t been to Brazil yet but I’m happy to be thoroughly informed through your post! Beautifully written and well balanced!! It’s so easy to judge without understanding the whole situation. I think the image of the kites flying over a city restricted due to violence is so striking. Here’s to hoping the games do have a positive impact on the community. Those areas of town deserve to be celebrated. I would love to take this tour to see all of the changes. The olympics have always brought major change to an area. It’s a good influx of money for areas that need some gentrification. I always cringe when I start to read pieces about visiting the ‘poorer’ areas of a city but I actually really loved this. You handled writing this very gracefully. Thank you for showing both sides to the situation. I do hope the 2016 Olympic games bring good to Rio! 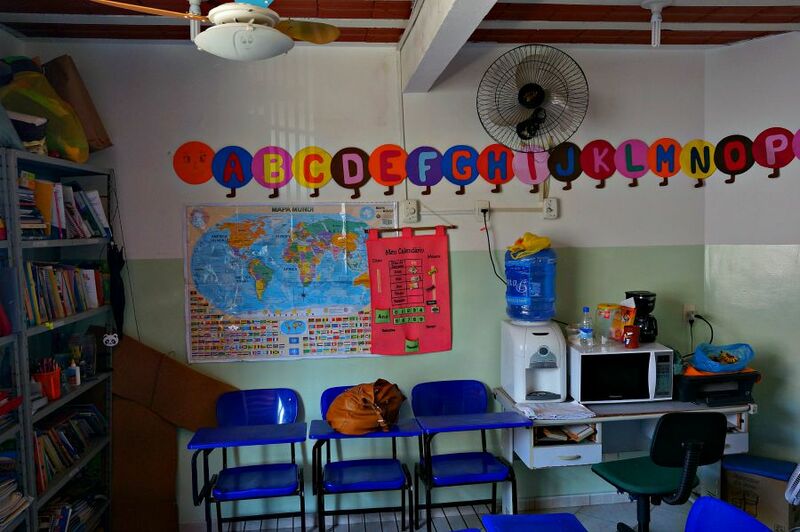 Dear Sean and Jen, thank you for this well-balanced, thoughtful and thought-provoking article on favelas and your experience on our special visit. We really want to be able to offer a different experience and one providing deep insight. It will certainly be interesting to see how things will be affected as next year’s Olympics approach. Thanks! We’re very curious about how things continue to change up to, and after, the Olympics, as well! Here in Miami, we have a large Brazilian population. They all usually talk about the corruption and many are upset that the government is spending money on stadiums instead of on the towns and people. It will be interesting to see how the country does after the spotlight is no longer on them once the Olympics are done. This is a well told account of your experience, I feel like I was there with you! There are so many complex issues surrounding Brazil and the Olympics. It will be interesting to see how it all plays out. 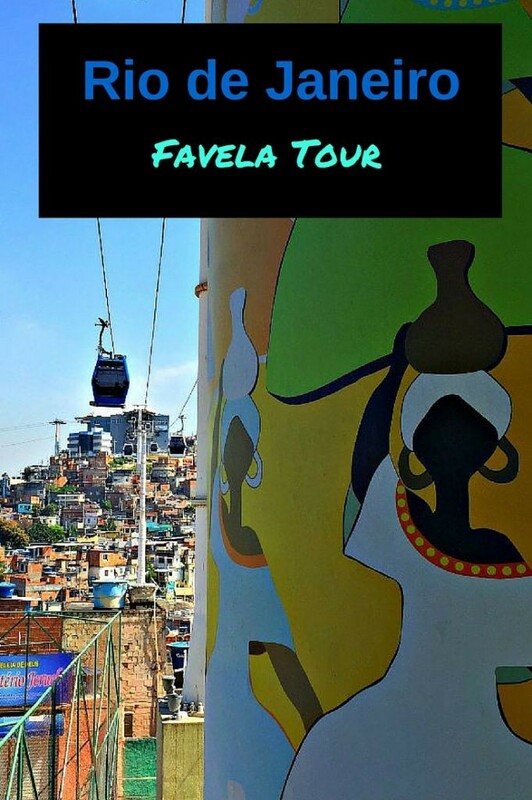 Thanks for sharing your experience and giving us an inside look at the favelas! Beautiful photos! I found a very similar approach to life in Argentina. There was a lot of mistrust of the government and a lot of corruption. But everyone that I met was so full of life and all about loving in the moment. It’s really amazing to experience! Yes, that’s one of the great things about visiting places and meeting the people…you get such a different viewpoint than those given by the press or government officials.